High peak canopies have a tall peak in the center. The outside rim is 8 feet high and the center rises to approximately 14 feet. These are often called festival style. 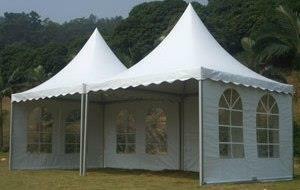 These are available in 10'x10', 10'x20', and 20'x20'. Please call for full quote with accessories. * Please call us with any questions about our high peak canopies rentals in Sedona, Cottonwood, Camp Verde, Prescott Valley, Chino Valley and surrounding metro areas.